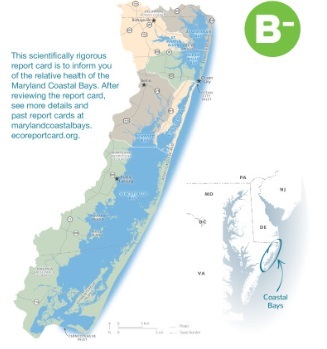 Maryland’s Coastal Bays receive a B-minus grade for the first time. Maryland’s Coastal Bays— those surrounding Ocean City and Assateague Island— just got their best grade ever on the state’s health index for water quality and bay life. The 2017 Coastal Bays Report Card awarded the Coastal Bays a B-minus, which the Maryland Coastal Bays program attributes to nutrient reductions in many areas since 1999. The health index is based on fur water quality indicators and two biotic (plant and animal) indicators. The report card grade measures the bays’ progress toward ecological goals determined by scientists. “This good news for Maryland’s coastal bays underscores the importance of monitoring these incredible ecosystems to ensure that we’re taking the right steps as a society to help them to be resilient and healthy,” President of the University of Maryland Center for Environmental Science Peter Goodwin said. The five coastal bays, which include Sinepuxent, Newport, Isle of Wight, Assawoman, and Chincoteague Bays, along with the St. Martin River, support many Eastern Shore residents’ livelihoods, ranging from agriculture, fishing, and forestry hunting, to tourism. “Maryland’s Coastal Bays are an integral part of our region, and are unique ecological treasures in the landscape of the Eastern Shore and our great state,” Governor Larry Hogan said. The Report Card is a scientific collaborative effort among the Maryland Coastal Bays Program, University of Maryland Center for Environmental Science, Maryland Department of Natural Resources, Virginia Institute of Marine Science and the National Park Service.